Viharamahadevi Park, once called Victoria park, is the showcase public park for the city of Colombo. It rests in a place of prominence in our city and has a vital role to play in the development and beautification of the proposed Megapolis. I have visited the park well over one hundred times in the last few years. It is a park where I have seen the poorest of the poor, and the richest of the rich traversing the same grounds, whether its famous politicians, media moguls, business magnates, Cambridge and Oxford graduates, or foreigners and diplomats. The populous of the city come to this place from the poorest of slums, as well as the mansions of Colombo 7, because this park is one of the few places in the city where there is space to move about, particularly for children. Before the former Defence Secretary took an interest in the park, it was in pathetic condition. It was among many other things, a breeding ground for dengue and a shabby place where many did not feel safe. 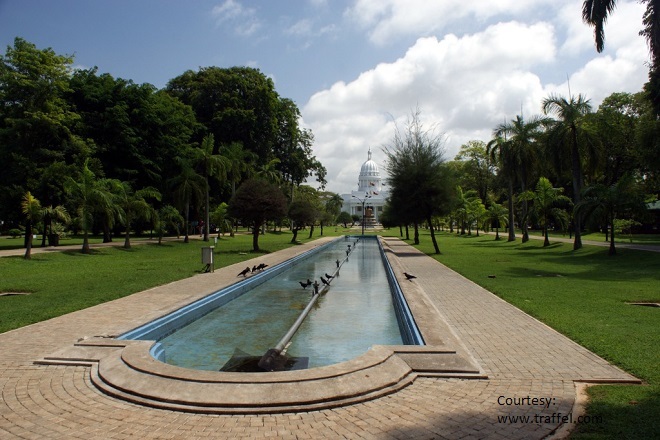 After the Ministry of Defence intervened, the fences came down, the grounds were enhanced, the trees pruned, the paving refurbished, the fountains fixed, the drainage improved and superfluous structures removed. The security forces patrolled and maintained the premises, and the bathrooms were relatively clean. The rehabilitation of the park is an achievement, which probably did not cost a lot of money, that has made a huge impact on the people of the city. The park is well used by people of all demographics, but mostly the poor. Here you see children of all ethnic and religious communities coming into contact with each other on joyful terms. Now for the bad news. Since the change in government, the park has deteriorated. Maintenance has not been kept up and you see deterioration in certain infrastructure. It is not bad yet, but you can see the situation is going in the wrong direction. Particularly disturbing is an unbecoming fence that has been erected to separate the area of the library and war memorial from the park. One of the great things the last government did was it brought down the walls separating the public from public places. The new government seems to have strangely reversed this stance in this particular instance. Unlike many development issues in Sri Lanka, taking the park up to its potential is not difficult. The previous government started the successful redevelopment, and now the new government has a golden opportunity to take the park to the next level. Most important in the agenda should be the expansion of the park, and the common development and re-invigoration of the adjoining premises. We need to close two roads. The first being the road separating the park from Town Hall, and the second separating the park from the museums, Nelum Pokuna, and the Sri Lanka Tennis association. After these roads are closed, the park needs to be expanded so that all these areas are part of its premises. In Washington DC for example there is a national mall, where open areas and museums are all connected for pedestrians. Roads move along the perimeter. Expansion of the park will immediately reinvigorate foot traffic to all the connected museums, and public areas. The people need to be connected to the museums and town hall, not kept away from them. This expansion will also more or less double the size of the park. Next we need to take down all the old buildings that have no architectural significance, and this means the Public Library. The open spaces of a park in the centre of the city are of paramount importance, and they should not be cluttered with large buildings whose contents can be shifted elsewhere. Colombo is in desperate need of a proper library, and the current facility is nowhere close to the mark. It needs to be relocated to a purpose-built facility. Most importantly, the children’s play area needs to be expanded and upgraded. This play area is a very special place in Colombo. It has to be one of the most used structures of its kind anywhere in the world. Most likely it is used well in excess of its safety capacity. It is crowded, dirty, and breaking down, but still it brings so much joy to the scores of children that are constantly using it. There are countless other important aspects of refurbishment and beautification that I shall leave to the experts. One of these experts needs to be the leader of this initiative. The leader should be competent, empowered, and love the park and what it stands for. He or she needs to walk the park almost every single day like an estate superintendent. Surely we have many people in this country who are up to the task. Just think about it. We can double the size of the park, and reinvigorate the whole area for negligible cost. We can give a benefit to the population of the city who reside in small cramped spaces with no room for children to run. The park has value to everyone: Rich or Poor, Sinhala, Tamil, Muslim, or even Foreigner. Already it is an extraordinary well used asset appreciated by a great number of people. There is certainly something intangible that makes this park much more important than people realize. It is a symbol of Colombo, and if our city is going to become a great one, the park has to become world class. It can be our small version of central park, or the national mall. Making this park an iconic part of the city is an achievable ambition that should be aggressively pursued. Policy makers have thus far failed to grasp the park’s importance and allocate the relatively minor resources necessary to make it among the most cherished places in the city. It is ironic, as the origins of this government were showcased at the Amphitheater inside the park premises. During the heart of the campaign that changed the government, the new leaders of this regime ascended the stage for the first time together at this very place. The political leadership should show some gratitude and give due respect to this special place. My fear is that they are too busy wasting the taxpayers money on other bright ideas.